Desert dwellers are always on the hunt for indoor summertime activities. Locally, we are fortunate to be blessed with a bevy of luxurious hotels and resorts that offer year-round amenities to guests and locals alike. The Camelback Inn is one of these said resorts. 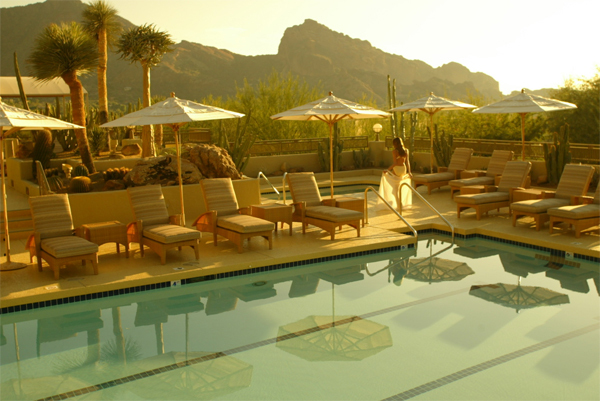 Whether grabbing a bite at BLT Steak, hitting the links at Camelback Golf Club or rejuvenating at the Inn’s world-class spa operation, The Camelback Inn proves its might as an all-encompassing resort retreat. This summer, The Spa at Camelback Inn is offering sensational summer spa packages definitely worth noting. Recently, AFM sat down with The Camelback Inn’s Spa Director, Kelli Ziegler, to learn more about the spa’s focus, future and summertime offerings. What is the overall philosophy of The Spa at Camelback Inn? Give us an hour and we will give you the day. If you had to describe the spa facilities at The Spa at Camelback Inn in one word (or a few words) what would it be? If you had time to receive only one spa treatment at The Camelback Inn, which one would it be and why? Camelback Signature Massage Treatment, 60 minutes, $160.00. Incorporates multiple spa modalities in one treatment such as aromatherapy, hot and cold stones, reflexology, detoxification and chakra balancing. The Spa at Camelback Inn is offering a sensational summer spa deal ($50 off any one hour facial, massage or body treatment). The spa’s central Paradise Valley location makes it easy for Valley residents to breeze in and out for some quick R&R. Could you describe a few treatments that fall into this special’s category? What is great about our special is that it is not limited to a select few treatments. It applies to all of our 60-minute Spa services, allowing the customer to choose the treatment they desire without limitations. What is on the horizon for The Spa at Camelback Inn? In the immediate future (summer 2012) we are looking forward to an overall spa refresh focusing on our spa pool area, lounges and solariums. The Spa at Camelback Inn, www.camelbackspa.com.